With a prevalence of 0.03 to 0.1% the von Willebrand disease is the most frequent bleeding disorder. The von Willebrand factor (VWF) has two important functions in hemostasis: First, it promotes the adhesion of blood platelets to the injured vessel wall and secondly it functions as a carrier protein for factor VIII and protects it as a chaperone from premature inactivation. The VWF is a glycosylated protein, that is organized in multimers. The size of the VWF multimers is regulated in vivo by a specific plasmatic protease. 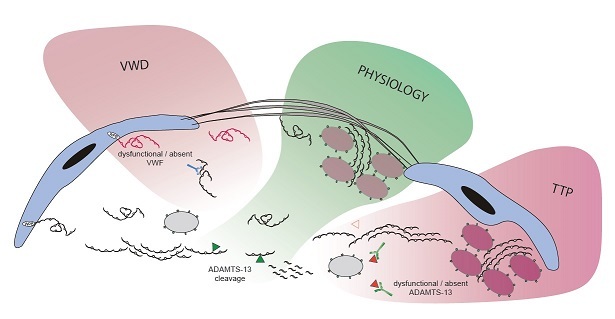 The lack or a severe reduction of the VWF cleaving metalloprotease ADAMTS-13 is associated with the thrombotic thrombocytopenic purpura (TTP).